Since the dawn of time, we have always had stories. These stories recorded the wondrous, the fantastical, the dystopian and the utopian. The past and the future. Our muses have long intertwined story with our hopes, dreams, and fears. This is the year we release those muses and follow their dealings with our inner worlds. This is year we celebrate the old myths, and create the new ones. The year we weave a new story. Join us, for a celebration of creativity in all of its myriad forms. Join us, and experience story as you have never experienced it before. To get started, you will need to register for the convention. We will attempt to post breaking announcements to our Facebook Page & Twitter Feed in addition to signage at-con. For your convenience we have a printable version of our grid available, as well as an electronic version of the program book. Klingon Pop Warrior will be performing after OPENING Ceromonies on Friday evening, not after Sunday's Closing Ceremonies as erroneously printed in our Program Book. See our Programming page & Mobile Guide for details on recently added sessions. Cancelled Sessions - due to unforseen circumstances the following have been cancelled. The work on the tollway has made getting to the hotel more difficult. If you are coming south on 53, you can get off at the Thiorndale RD exit but remember the mantra KEEP LEFT. If you get into a right lane you will have a hard time moving left. Rather than the Thorndale Exit, our Hotel Liaison recommends using Biesterfield. Use the left of the 2 right turn lanes and turn south on 53 at the first light, then turn left at the 2nd light at Devon Ave and turn right at Park boulevard. Coming north on 53, be in the right exit lane. The left lane puts you on 390. Once you take the right lane away from 390, THEN KEEP LEFT. Regrettably, our special guest Tanya DePass will not be joining us this year due to a schedule conflict. We wish her well, and look forward to hosting her in the future. 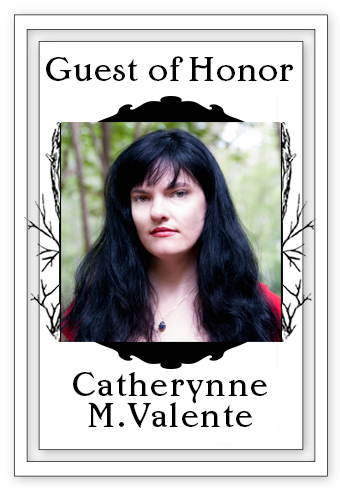 Catherynne M. Valente is the New York Times best-selling author of over two dozen works of fiction and poetry, including Palimpsest, the Orphan's Tales series, Deathless, Radiance, and the crowdfunded phenomenon The Girl Who Circumnavigated Fairyland in a Ship of Own Making. She is the winner of the Andre Norton, Tiptree, Mythopoeic, Rhysling, Lambda, Locus and Hugo awards. She has been a finalist for the Nebula and World Fantasy Awards. She lives on an island off the coast of Maine with a small but growing menagerie of beasts, some of which are human.